The inimitable Jung Chang shared with us the story of Empress Dowager Cixi the subject of her latest book and the most important woman in Chinese history. Under her rule China advanced immeasurably, moving from an ancient state of civilisation to becoming a modern nation with most of its attributes: industry, rail, and electricity, mass communication for the first time with the introduction of the telegraph, plus an army and navy with up-to-date weaponry. Empress Cixi abolished the barbaric punishment of ‘death by a thousand cuts’ and put an end to foot-binding. She advanced the rights of women in China and and embarked on the path to parliamentary elections. However she was much feared and was responsible on the eve of her death in 1908 for the murder of her own adopted son the Chinese Emperor Guangxu. “The day before Cixi died, when she knew she was going to die, she had the emperor poisoned” said Jung Chang. “This was definitively established in 2008, when the emperor’s body was exhumed and subject to forensic examination.” The body contained 2400 times the normal level of arsenic. She believed that if she had not assassinated Guangxu that China would have fallen to Japan. 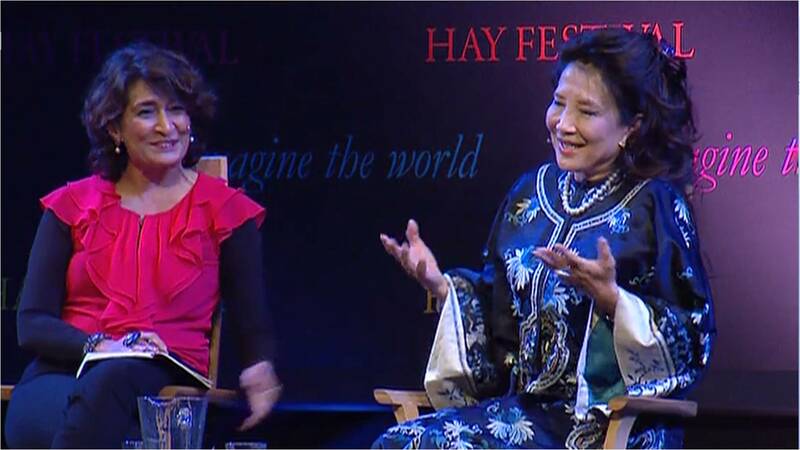 In questions Jung Chang talked about the fact that her most famous book Wild Swans is popular in China despite the fact that it is banned because tourists take copies in and it is shared online. Razia also asked about the stunning dress she was wearing and the writer confirmed it was from the period in which Cixi lived. “This thing is from her time and at that time women wore these kinds of clothes. It comes from an Italian lady. She gave me this robe becasuse she loved Wild Swans”.